A spatial filter can be mounted to a Ø1.5" post using the #8 (M4) counterbores on the C1511(/M) Post Clamp. 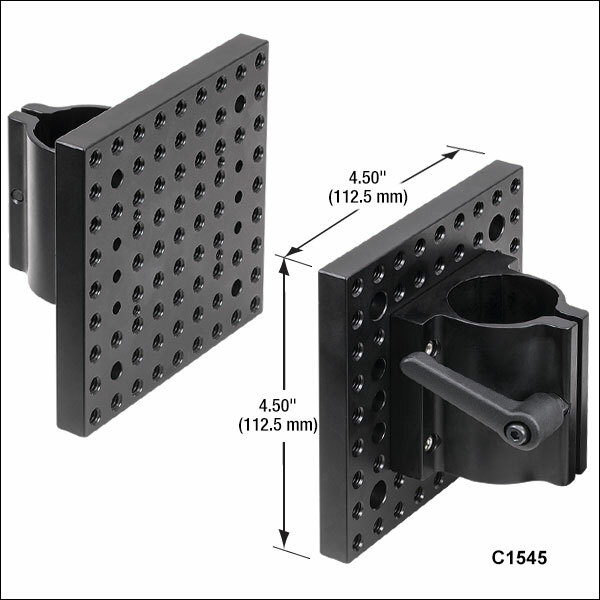 The C1511(/M) and C1545(/M) Ø1.5" Post Mounting Clamps are an integral part of our Ø1.5" Post Assemblies, providing rigid, general-purpose mounting surfaces. These mounting clamps can be used for fastening our wide array of optomechanical mounts in much the same way breadboards are commonly used. The clamping mechanism is directly compatible with our Ø1.5" Posts. Vertical positioning is achieved by sliding the rear clamping mechanism along the length of the Ø1.5" post. Once the desired vertical position is achieved, the clamping mechanism is actuated with the attached handle. Alternatively, this handle can be replaced with a 1/4"-20 (M6) cap screw. 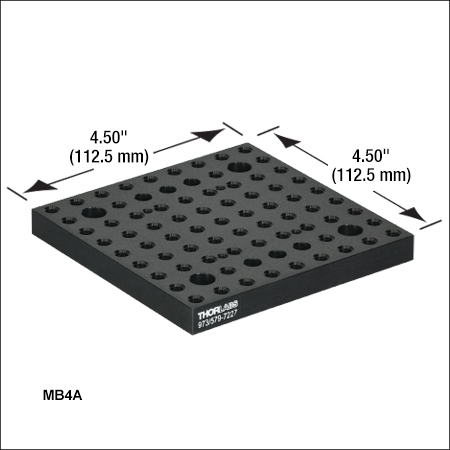 Additional mounting plates can be purchased separately below. 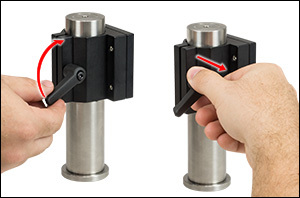 For users of the previous generation of post mounting clamps, a quick-release handle is available that allows for a simple and reliable way of securing these clamps to a post. It is easily installed by replacing the 1/4"-20 (M6) locking screw in the post clamp. The 2.03" (51.4 mm) long handle contains a 1/4"-20 (M6) threaded stud that engages the part by simply rotating the handle. 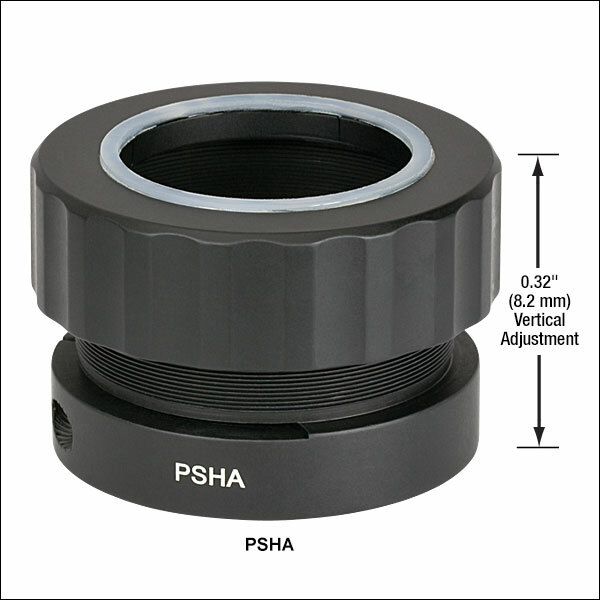 The PSHA(/M) Adjustable Height Ø1.5" Post Collar offers a convenient height adjustment for post mounted hardware. 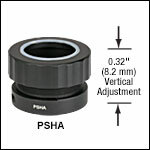 An easy-to-access actuator ring allows fine height adjustment at 0.025" (0.64 mm) per revolution. This collar also allows components to be freely rotated without changing height. Is it possible to have an un-anodised version of C1545/M (to be vacuum compatible) and how much it will cost? Thank you for your feedback. 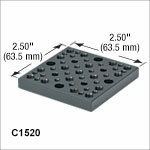 We can offer the C1545/M with its aluminum components unanodized. You can also contact techsupport@thorlabs.com directly for quotes on unanodized products. However, the C1545/M has a Nylon handle which will limit this product's vacuum compatibility. I will reach out to you directly to discuss your application and possible alternatives. 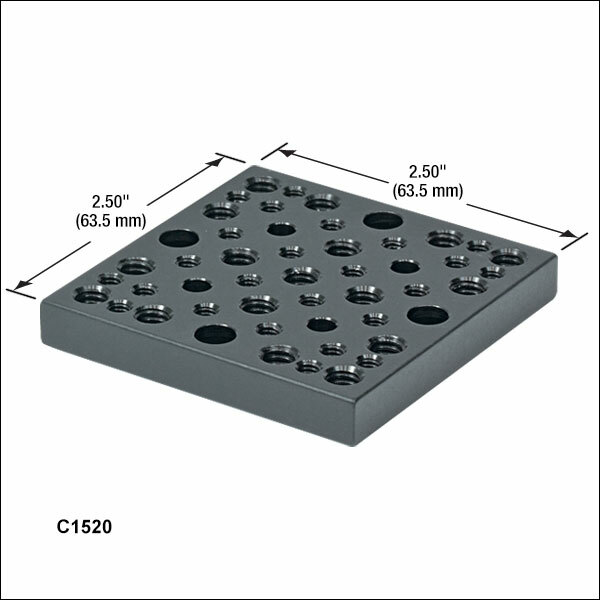 Do you offer a plate similar to your C1520 but with mounting holes for 30 and 60mm cages? If not, such a plate would offer another option to install cages on 1" or 1.5" posts. The mounting holes could be unthreaded 6mm with side locking screws along the principle of your standard cage plates or, if using your C1001(/M), the detachable mounting plate would have the unthreaded 6mm holes and the parts that attaches to the post would have 4-40 threads for the studs. Hello, thank you for contacting Thorlabs. I will reach out to you directly to discuss various options for integrating cage systems and posts. Response from Jeremy at Thorlabs: The screw material is stainless steel. Response from Jeremy at Thorlabs: I'm assuming you are mainly looking for the tolerance of the bore that the post goes through. Worst case, there is there could be 0.019" clearance between the post and clamp prior to tightening. The nominal gap is 0.015" and the minimum gap is 0.014". When clamping the metal will close evenly so there should be minimal angular drift, but the tolerances of the plate could result in an angular difference of about 1.6mrad (calculated). Once tightened, how close to plumb can I expect the front face of the C1501 to be? How tight are the tolerances? Response from Javier at Thorlabs to mpartlow: thank you for your feedback. Although we have not tested the C1525 mounting post clamp for maximum load capacity, we are confident that it will be able to effectively support a heavy collimator or isolator, as the clamping force would allow for supporting several pounds. Is there a recommended maximum weight load for the C1525 attached to a 1.5" post? I am considering using it to hold a heavy collimator/isolator. Thorlabs' C1511(/M) Post Mounting Clamp features a removable front plate that provides a variety of tapped holes and counterbores. This post clamp and mounting plate combination has been designed to work in conjunction with our popular Ø1.5" Posts. This clamp features a quick-release handle for securing the clamp to a post. 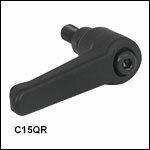 The 2.03" (51.4 mm) long handle contains a 1/4"-20 (M6) threaded stud that engages the part by simply rotating the handle. An internal ratchet-type mechanism allows for the handle's rotational position to be adjusted without actuating the mounting stud. In the drawing to the right, the locations of the tapped and counterbored holes are called out by letters, while the dimensions and type of each hole are listed in the table above. C1511 Ø1.5" Post Mounting Clamp, 2.50" x 2.50"
This adapter plate gives additional versatility to the C1511(/M) Mounting Post Clamp by allowing assemblies on the adapter plates to be swapped. As shown by the drawing above, it contains a generous distribution of 8-32 and 1/4"-20 tapped holes and #8 and 1/4" counterbores. C1520 Adapter Plate for Ø1.5" Post Mounting Clamp, 2.50" x 2.50"
Thorlabs' C1545(/M) Post Mounting Clamp features a removable front plate that provides a variety of tapped holes and counterbores. This post clamp and mounting plate combination has been designed to work in conjunction with our popular Ø1.5" Posts. 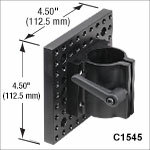 C1545 Ø1.5" Post Mounting Clamp, 4.50" x 4.50"
This adapter plate gives additional versatility to the C1545(/M) Large Mounting Post Clamp by allowing the assemblies on the adapter plates to be swapped. As shown by the drawing above, it contains a generous distribution of 1/4"-20 tapped holes and #8 and 1/4" counterbores. 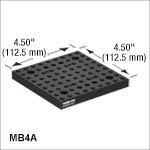 MB4A Adapter Plate for Ø1.5" Post Mounting Clamp, 4.50" x 4.50"
To use, slip the collar over a Ø1.5" post and hold at the desired height. Tighten the 1/4"-20 (M6) cap screw to secure the collar's position on the post via the flexure clamp. Place an optomechanic around the post on top of the collar and twist the actuator ring to adjust the component's height. The height can be locked by tightening the 8-32 setscrew with a 5/64" (2 mm) hex. The nylon ring on top of the collar prevents marring while adjusting the height. 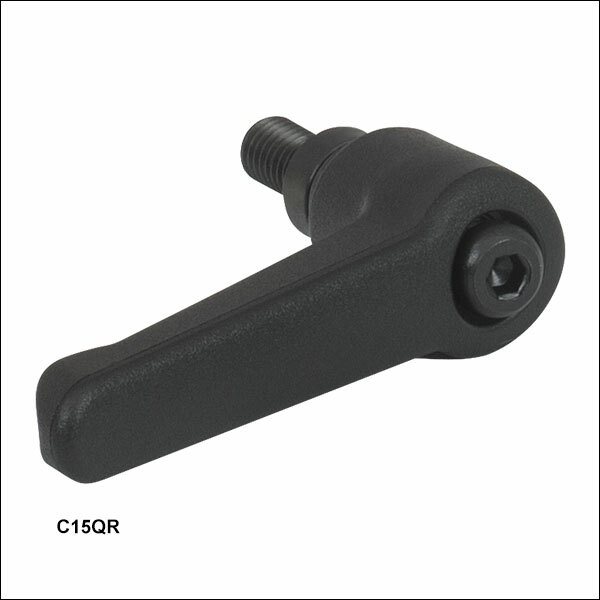 The C15QR(/M) Quick-Release Handle provides a simple and reliable way of securing a flexure-based Ø1" (Ø25.0 mm) or Ø1.5" post clamp. In many cases a cap screw is used to lock a flexure-based clamp in place on a post, which requires a balldriver for adjustments. Depending on the mounted load, using a balldriver can be difficult, or even unsafe. This quick-release handle mitigates this problem by allowing the clamp to be hand-tightened, ensuring better control over the amount of torque applied to tighten or loosen the clamp. This also decreases the amount of time needed for basic setup and alignment by eliminating the need for additional balldrivers and allowing for a quick way to secure a clamp. Easily installed by replacing the 1/4"-20 (M6) locking screw in a post clamp, the 2.03" (51.4 mm) long handle contains a 1/4"-20 (M6) threaded stud that engages a part by rotating the handle. Once the handle is tightened to secure a clamp to a post, the internal ratchet-type mechanism allows for the handle's rotational position to be adjusted without actuating the mounting stud. Simply pull the handle outwards to disengage it from the mounting stud, as shown in the image to the right, then rotate it to a more convenient position. This feature ensures that the handle will always be accessible to the user.